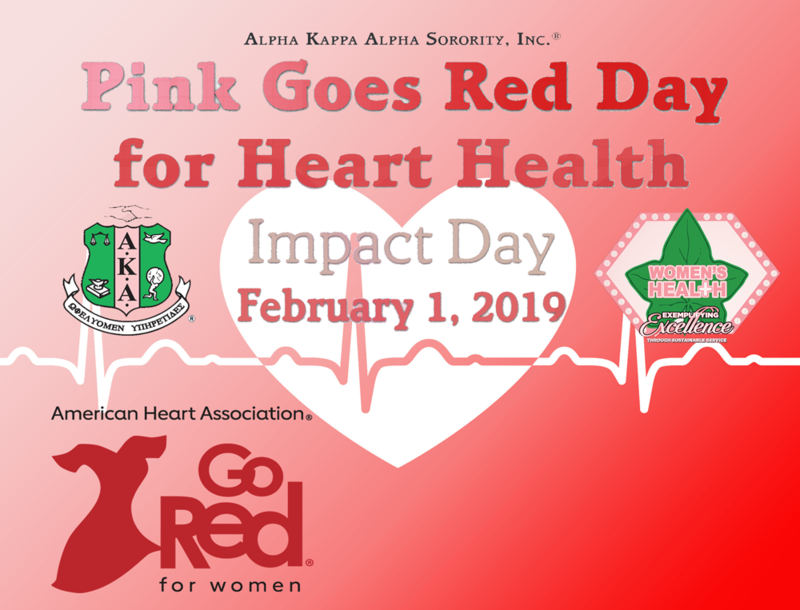 Alpha Kappa Alpha Sorority, Incorporated is proud to join the American Heart Association in the fight against heart disease in order to improve the health of all women. On this special day, Alpha Kappa Alpha women will take off our pink and wear red for the day to raise awareness of this deadly disease and promote life changes that will increase the longevity and quality of the lives of women around the globe. Our sixth Community Impact Day, Pink Goes Red for Heart Health Day, is upon us. Alpha Kappa Alpha chapters are bringing awareness to the devastating effects of heart disease in communities around this country. As we observe Pink Goes Red Impact Day on the international level in Atlanta, Georgia, here are some unsettling truths about heart disease and high blood pressure and undeniable truths about prevention that can help to stem the tide of this dreadful disease. Cardiovascular diseases kill nearly 50,000 African-American women annually. Forty-nine percent of African-American women 20 years of age and older have heart disease. Only one in five African-American women believes she is personally at risk. Only 52 percent of African-American women are aware of the signs and symptoms of a heart attack. More than 40 percent of African Americans suffer from high blood pressure which is more severe in African Americans than whites and develops earlier in life. Early diagnosis and treatment can result in a better quality of life and lower mortality from the condition. Medical researchers have found that there may be a gene that makes African Americans more sensitive to the effects of salt which, in turn, increases the risk for developing high blood pressure. As little as one extra gram (half teaspoon) of salt in people who have this gene could raise blood pressure. African Americans generally tend to have higher rates of obesity and diabetes which puts the population at greater risk for high blood pressure and heart disease. Be honest with and about yourself. African-American women, particularly those who consider themselves perfectly healthy, too often fail to acknowledge that their perception may not always equal reality. Lower your salt and sodium intake. Before you consume it, read the label and be knowledgeable about what is contained in the food you eat. Commit to improving your eating habits by developing a healthy diet and healthy cooking skills. Eat more fruits and vegetable and stay hydrated. Get moving! Practice an active lifestyle and eliminate sedentary practices from your daily routine. Schedule regular check-ups with your physician to monitor your health. Wear red to commemorate heart health. Partner with the American Heart Association to promote heart health by posting guidelines for heart health and risk factors of heart disease on chapter social media pages. Plan hart healthy activities such as engaging in excercise, preparing a healthy meal or heart health screening by a medical professional. USE #AKAPINKGOESRED on chapter social media pages. Participate in Walking with the Supreme by walking 8,000 steps and recording your steps here.